My table at the art fair is all set up with about 250 cards - every one different - and I'm still not done. I shall be handing over my contribution to the tombola prizes when I arrive in the morning: I have decorated a box and made some cards to go inside. A friend gave me lots of flat, unused boxes which I think we're destined as cake boxes but they are plain kraft one side and glossy white on the other. Not been inspired to use them until today when I laid a square envelope inside and did a quick remake on the dimensions to make the box fit. It will take 6 cards easily so here is a picture with 3 of those destined to go in it. The ribbon is just for now until it is handed over: They'll want to see inside and possibly even leave it open to show what's inside over the next few days. This is the 4th year I've done this event - Always fun with a great range of art displayed so I'm looking forward to it. I have used Tim Holtz's technique of using Distress ink inside a Texture Fade embossing folder on one of the cards and the same technique with a Cuttelbug folder (Script) on the box. 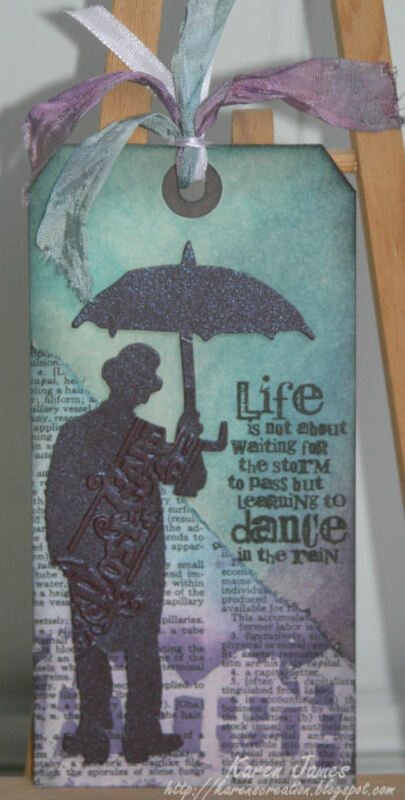 The technique is the Grungy Monday #4 challenge so head over to Linda's blog to see learn more and the Simon Says Stamp and Show challenge is to use a Tim Holtz technique so I've covered that too! On the card, I've also inked over the raised parts for contrast - Pumice Stone direct from the pad where it is darker and with a blending tool where it is lighter. Papers: DCWV (I think? 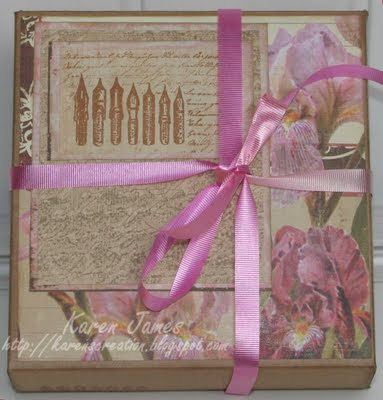 ); Stamps: Tim Holtz; Distress Inks: Faded Burlap, Tumbled Glass and Pumice Stone. I'm at a craft fair over Easter so have been making lots of quick cards to sell and to put together in a folder to donate as a tombola prize. 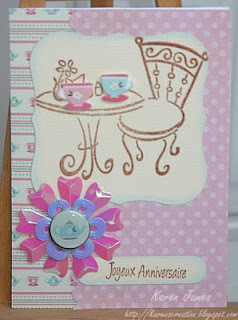 Here is a 'merci' (thank you) card using the Sketch Saturday #151. I used scraps of paper left from scrapbook projects with Nestabilities, Cuttlebug butterfly, PaperMania ribbon, Artemio stamp and ColorBox ink. I added sparkle with Stickles Ice Diamond and PaperMania gems so I am also adding it to the ABC challenge 'S is for Sparkle'. 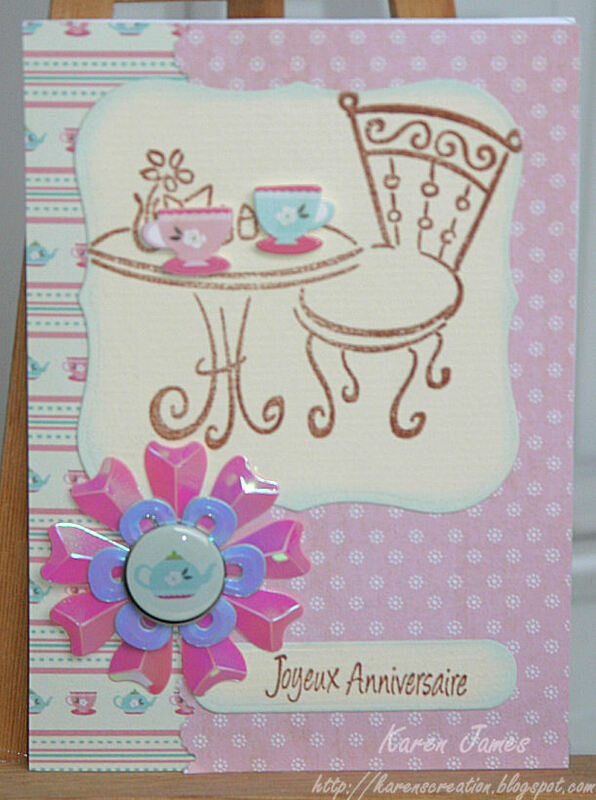 Voici ma carte pour le challenge #151 de Sketch Saturday et du challenge ‘Sparkle’ chez ABC-challenge. 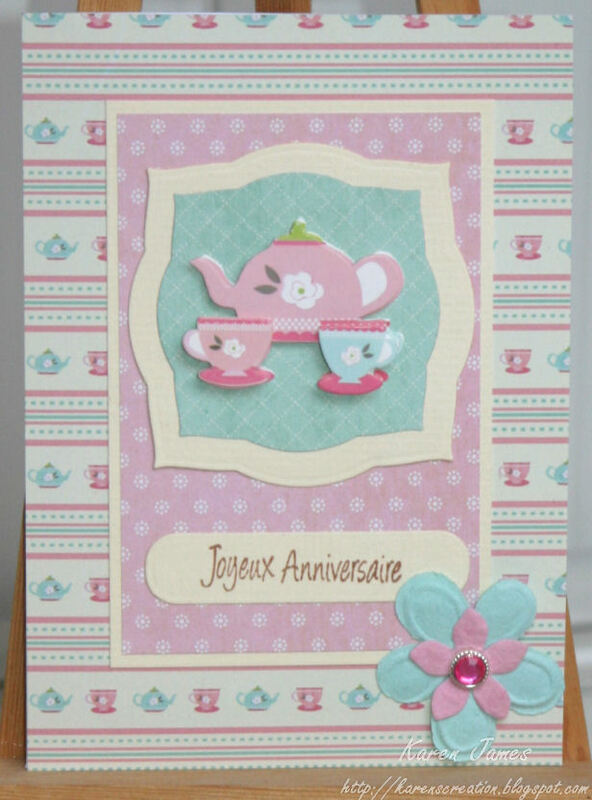 Réalisé avec des chutes de papiers, Nestabilities, papillon de Cuttlebug, ruban, tampon d'Artemio, encre ColorBox, Stickles et quelques pierres. 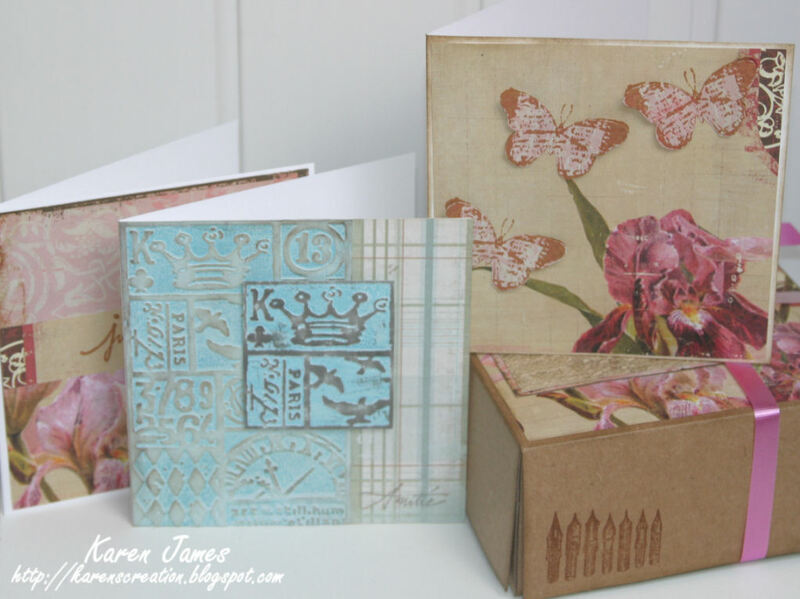 Finally got to take stock of the Tim Holtz-designed Sizzix Vagabond machine this week and one for me, of course! So I had to try it out and used the new Sewing Room die with idea-ology grungeboard to justify to myself that I needed a machine that will cut thicker materials: It was an absolute dream! I love it. So, started this piece yesterday and finished it today with 2 challenges in mind: Grungy Monday challenge to use ColorWash, and Simon Says Stamp & Show challenge 'Distressing'. I have used a wooden shallow tray approximately 21cm (8.5") square which I wiped over with a mixture of watered-down white acrylic paint coloured with 'Stream' ColorWash. This was then distressed with more white acrylic smeared on and 'Frayed Burlap' Distress Ink rubbed on round the edges. I scanned and printed some real cotton reel labels to add to these new ones and aged them all with the Frayed Burlap I used that and 'Walnut Stain' to colour the grungeboard. Tim's new Kraft Resist paper and the idea-ology 'Trimmings' flowers were coloured with Distress Stain 'Spun Sugar' and the dress shape was made with Claudine Hellmuth Sticky-back Canvas sprayed with more 'Stream' ColorWash, stuck on to the grungeboard and trimmed to fit. I then picked all round it to show the fibres and make it shabby. 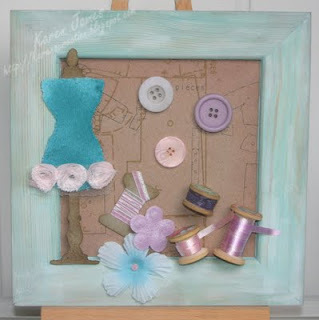 Finally, I added buttons and bits of ribbon and flowers from my stash in keeping with the shabby chic tones. Everything was stuck down with Studio Matte Multi-Medium so I know it will stay stuck when displayed. It's a kind of magic ! Yes, I admit I've been listening to Queen's greatest hits :) However, if you try the technique that is this week's Grungy Monday challenge, you'll see why the title is appropriate. 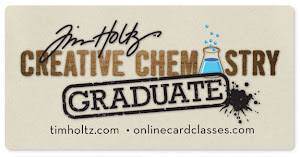 I've used resist techniques with paint and embossing powder but they're not as magical as using Claudine Hellmuth's Studio multi-medium matte: You cannot see anything as it dries flat and invisibly, then you add Distress Ink and WOW! 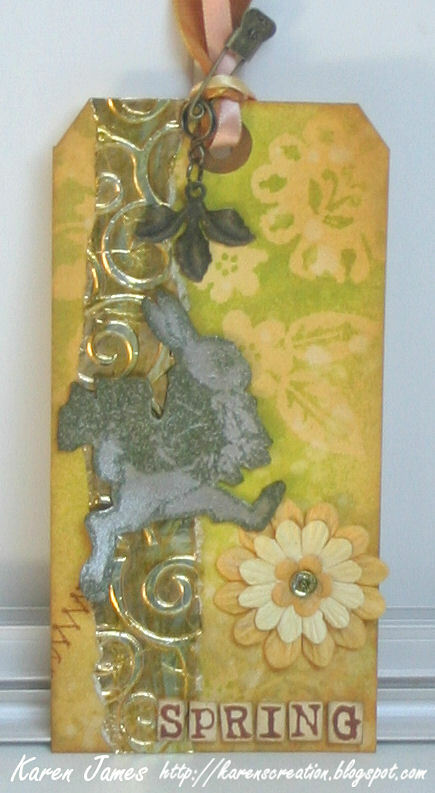 As this tag is definitely not a card, I'm also entering it in the Simon Says Stamp and Show challenge. Apart from the medium and die-cut, I also used: Ink-essentials manilla tag; dictionary page; foam; Tim Holtz Sizzix 'Townscape' die; Distress Inks in Stormy Sky, Broken China, Dusty Concord and Black Soot; Tim Holtz idea-ology 'Trimmings' ribbon coloured with Distress and Tim Holtz sentiment stamp with black Versafine. J'ai créé deux cartes simples avec les papiers et attaches parisiennes de la gamme 'Dovecraft Tea House' et Nestabilities. Used Dovecraft Tea House 6x6 (15x15cm) papers, 3D stickers and brads; Dovecraft cards and envelopes; EKS border punch (scalloped scallop); Spellbinders Tag Trio and Nestabilities Labels 1 and Labels 3 in the Cuttlebug; cream card and flowers from stash. Linda has started the Grungy Monday challenges which will take inspiration from Tim Holtz' techniques. This week's was to take inspiration from Tim's tag #10 from Christmas 2008. I created my interpretation for Spring and at the same time worked in lots of gold for this week's Sunday Stamper challenge over on Hels blog. I used Inkessentials manilla tag; Florets mask, Grungeboard, Foliage, Trinket pin, and Charm clip from Tim Holtz idea-ology line; Perfect Pearls mist 'Hierloom Gold', Cosmic Shimmer 'Gold Mint'; Distress Inks: Scattered Straw, Wild Honey, Forest Moss, Frayed Burlap; Distress Powder: Peeled Paint; Archival Ink: Sepia; Stamps: Tim Holtz 'Spring Sprung'; Perfect Pearls 'Pearl' powder; Prima flowers; Cuttlebug embossing folder: D'vine Swirl on some gold paper inked with Alcohol Ink 'Citrus' and I used the same on the snap used as the flower centre; ribbons from stash. I was interrupted part way through making this by an elderly neighbour asking if she could look round our garden to see if the plants she'd shared with me last year had grown: Fortunately, spring has arrived and I managed to find proof that most are alive and well. Just a shame the weeds always grow faster!